Particle-based dynamic simulation with a small number of particles. Smoothed surface using an exsisting smoothing method (PN triangles). Smoothed surface with penetration avoidance and wrinkle deformation. We develop a real-time cloth simulation method which combines particle-based dynamic simulation and geometric surface deformation. 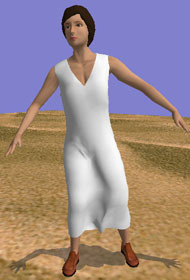 First, the global motion of a garment is computed using a particle-based dynamic simulation with a coarse cloth mesh. Then a fine cloth surface is generated from the coarse cloth mesh using a geometric smoothing method. The fine cloth surface is then deformed so that it fits the underlying body. In addition, it is deformed based on the out-plane forces working on the surface and the length of the surface. Using this geometric deformations, plausible local behaviors of clothes are efficiently simulated without an expensive dynamic simulation. 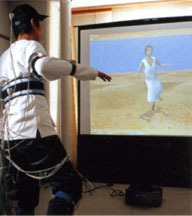 We also develop a virtual try-on system in which the user can try on any cloth in the virtual environments by combining a motion capture device with the real-time cloth simulation.